Power Electronics has a strong commitment to reduce the levelized cost of water (LCoW) by offering upgraded energy saving solutions. Synergies between our Industrial and Solar Divisions have come together in the SD700 Solar Power – Variable Speed Drive SD700SP. 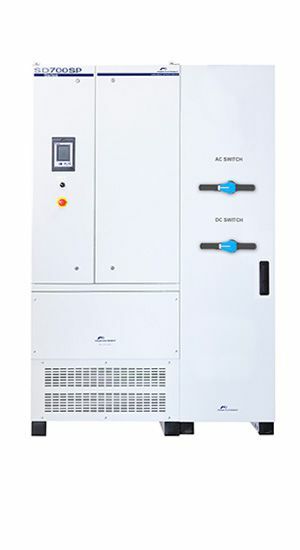 This unique product takes advantage of the outstanding features of the variable speed drive SD700 to power pumping systems from either the solar PV panels (off-grid) or simultaneously from the PV panels and grid supply (PV solar assisted). The Variable Speed Drive SD700SP is a compact fully factory approved solution comprising: a customised SD700 VSD, DC protections, disconnection and filtering, and an upgraded firmware, which leads to easy installation and commissioning. Our engineering and consulting department will support you with PV sizing and SD700SP selection by means of a dedicated study of your application (pump curves, static head, minimum flow, etc…). REDUCE YOUR LEVELIZED COST OF WATER (LCoW) BY INSTALLING SD700SP.